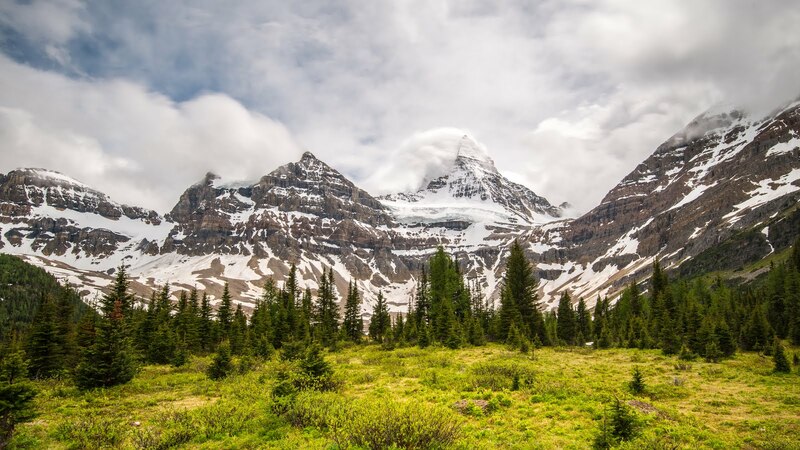 During our 15 days in the Canadian Rockies, we only booked three activities. A helicopter to Assiniboine, a white water rafting trip, and a glacier hike. All three were amazing experiences and I've already shared in my last post how Assiniboine was my favorite part of the trip. 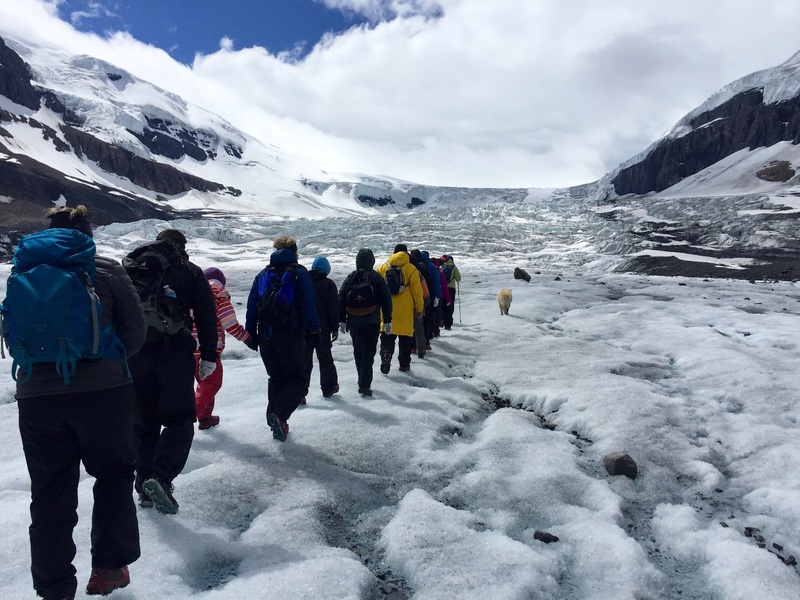 Another highlight was the glacier hike we booked through Ice Walks. 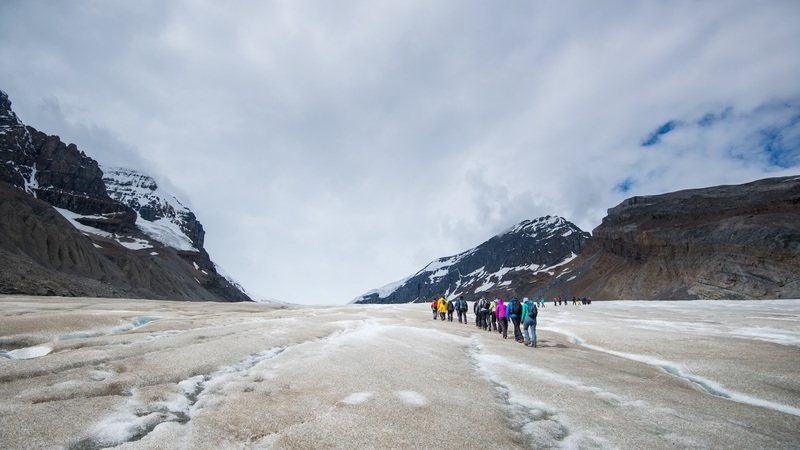 If you want a chance to walk on a glacier (without serious risk of death) while in the Canadian Rockies, then you must check it out. 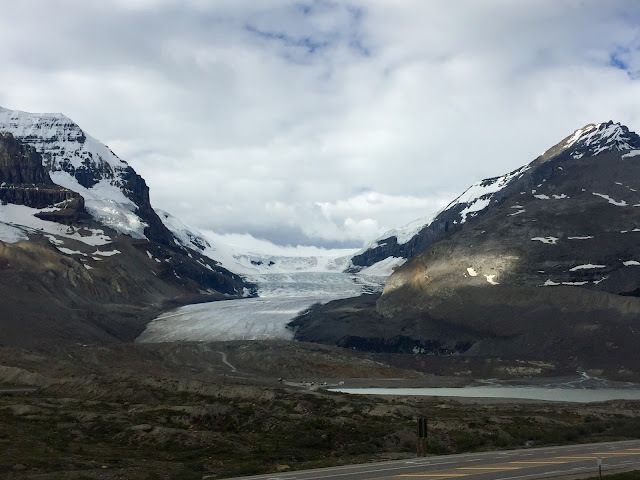 It's on the Athabasca Glacier, which is one of the main stops of the Icefields Parkway, a 144 mile scenic drive from Banff National Park to Jasper National Park. About halfway along the route, you will come across the the visitors center perched direclty across the parkway from this moving river of ice. It's spectacular to see first hand and this picture doesn't even begin to put the size of this landscape into perspective. 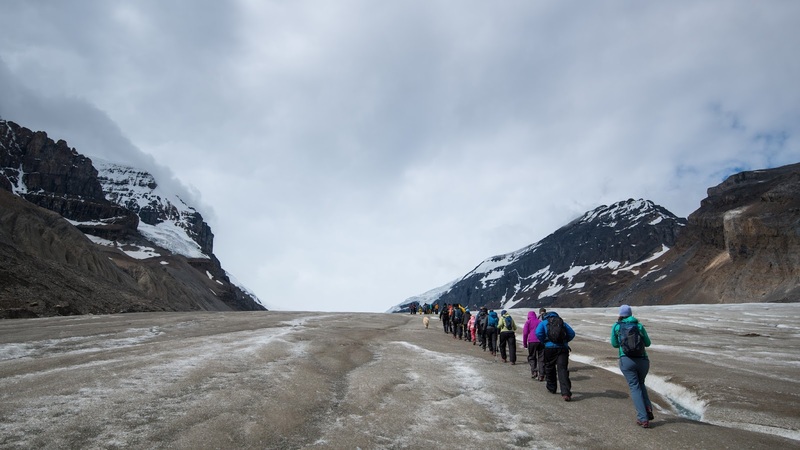 If you want to get out on the glacier there are two options; (1) a crowded tour on a massive ice bus that drops you out onto the glacier for a few minutes or (2) an ice walks tour. Hands down, the ice walks tour is the way to go. Since we were without Landon we booked the all day icewalk deluxe tour which lasted about six hours. We figured we might as well have the most in-depth experience possible since it's not everyday we get to go out on a glacier. Our guide, Peter also happened to be the owner of the company which he started in 1985. And while Peter was wonderful, knowledgeable, and friendly, his trusty partner of 12 years George totally stole the show. For the few kids we had on the walk, I'm not sure the glacier even competed against George as the best part of the trip. 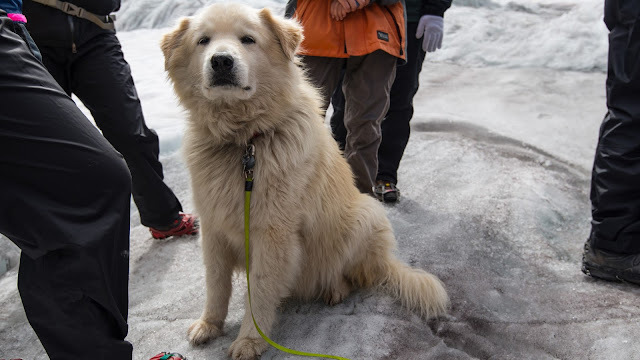 He's large, a little smelly, and just wanted to lay down, but you could tell he felt just as home on the glacier as Peter and we couldn't have asked for two better guides for the day. We started out by gearing up for all possible weather situations then set out from the parking lot to the glacier in a small group of 14. 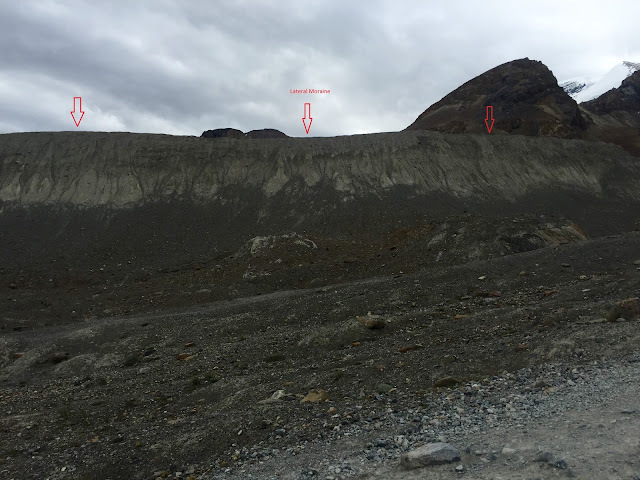 As we walked from the parking lot up to the foot of the glacier, signs marked were the glacier once stood over the years. 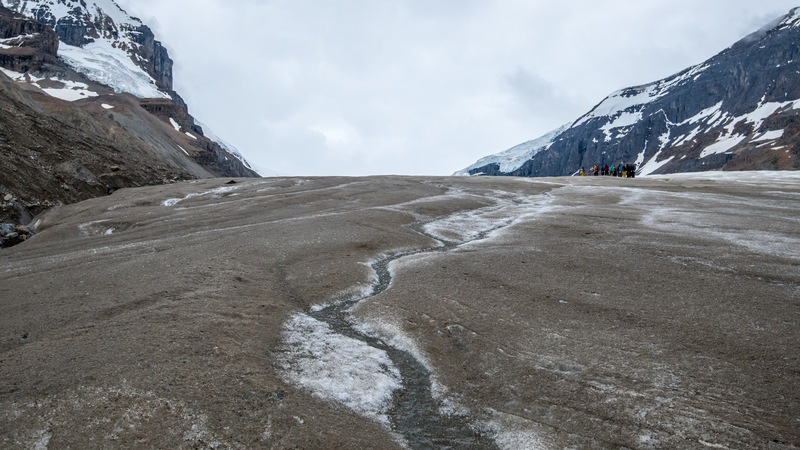 At its maximum in 1844, the glacier would have crossed the road and reached all the way to the visitors center. Unfortunately, it's not only receding, but also melting. Peter pointed out the lateral moraine on the rock wall above us pointing out the high point of where the glacier once reached. Being in the middle of the area and knowing less than 200 years ago we would have been in the middle of a massive moving ice wall was pretty surreal. 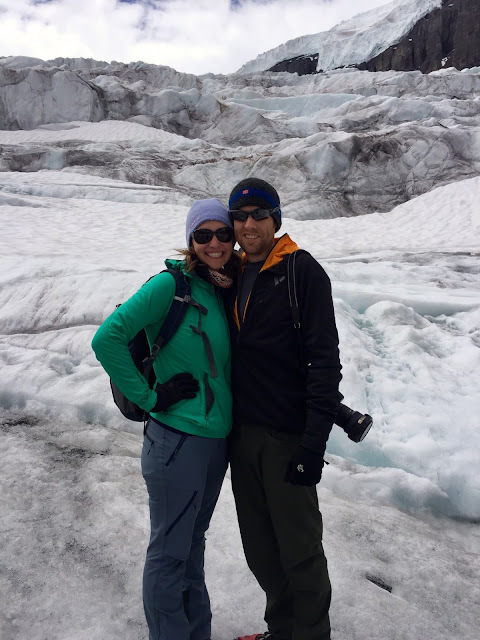 We reached the foot of the glacier and strapped some micro spikes to our shoes and we were ready to tackle the glacier. Adam helped Peter fashion a makeshift bridge over a small stream with a plank and a metal rod for a handrail and one by one we made our way onto the ice. Despite the brown color, that is ice in the picture above. At the end of the tour when Peter asked what we thought of the glacier Adam jokingly remarked that it was a bit dirty and needed a good cleaning. The dirt is partially from traffic, pollution, rock sediment and even melting. 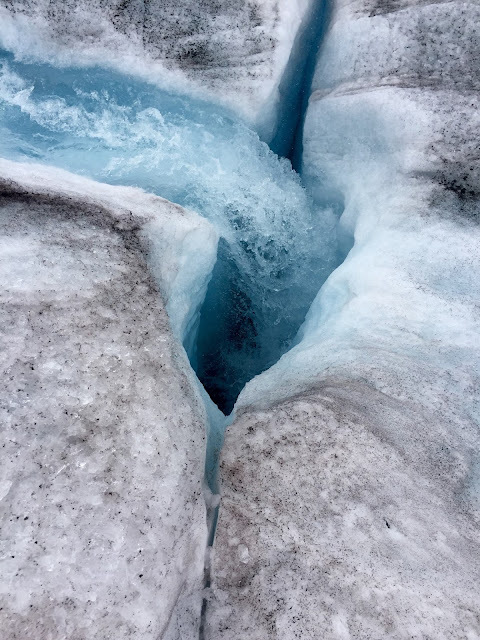 However, just under the dirt you could see the brilliant blue ice and as we made our way up, the color became more clear. It was surprising how dirty it seemed right on top of it since from a distance it looks so white. It was also a bit rougher than I expected. I guess I've never experienced sheer ice to that degree and I was forever grateful for the spikes on my hiking boots. Immediately we started to head up the length of the glacier with the icefall as our final destination. We were instructed to walk in a single file line with George and Peter leading the way. I was impressed that Peter made a point to pick out each person, have them walk and talk with him as we headed up and back. It was a small gesture, but made a huge difference on a tour when you have to walk single file. 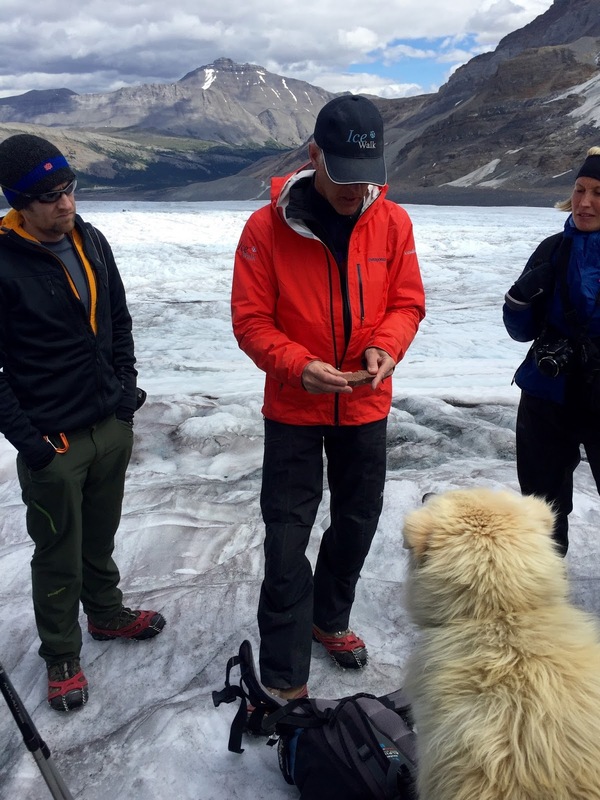 It also proved Peter not only loved the glacier, but sharing it with others as well. 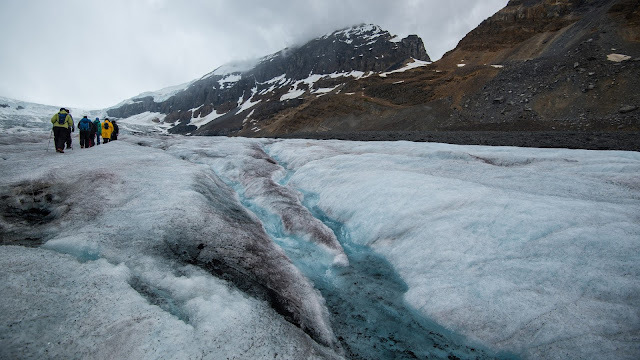 As we walked, we passed over streams of water running down the glacier. The water was ice blue and really beautiful to see snaking its way along the ice knowing it was cutting a path with its relentless force. 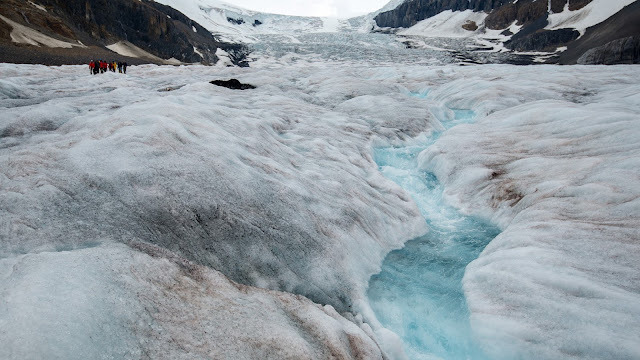 A glacier, while moving at an incredibly slow pace does move. And constantly. 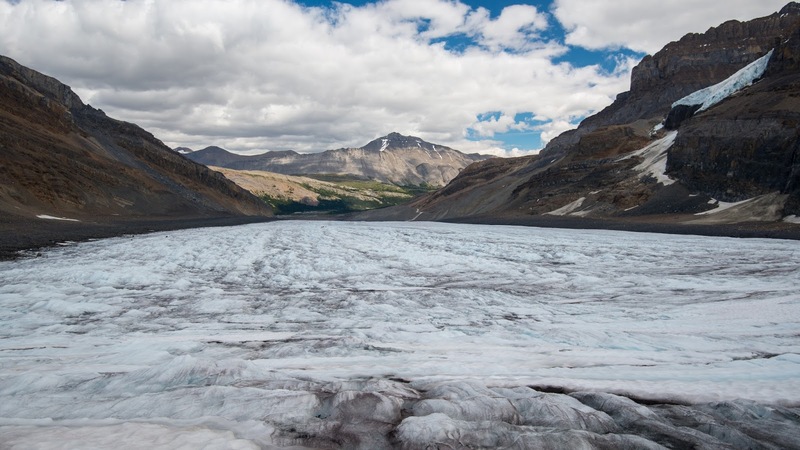 The Athabasca glacier moves about 2-3 cm per day at the toe for a total of 15 meters (49 feet per year). 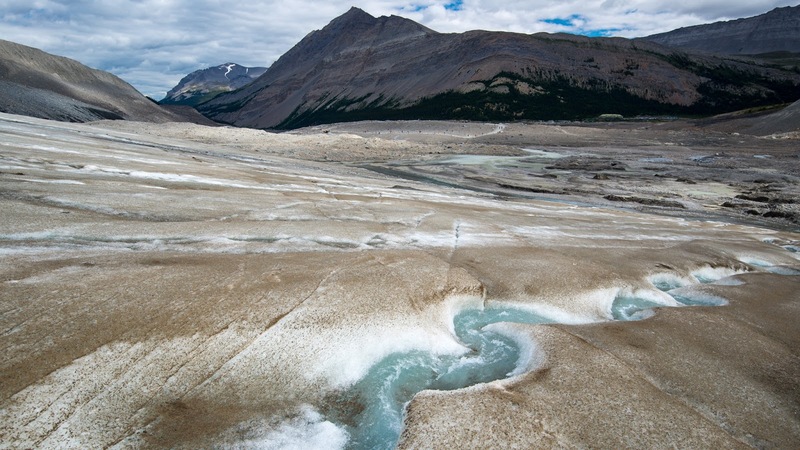 It's also melting at a rate of about 25 meters (82 feet) per year. Although you cannot feel it moving while on it, you can fully understand the magnitude of forces at work. It's impossible not to feel so insignificant on such a vast landscape. Humbling and powerful at the same time. 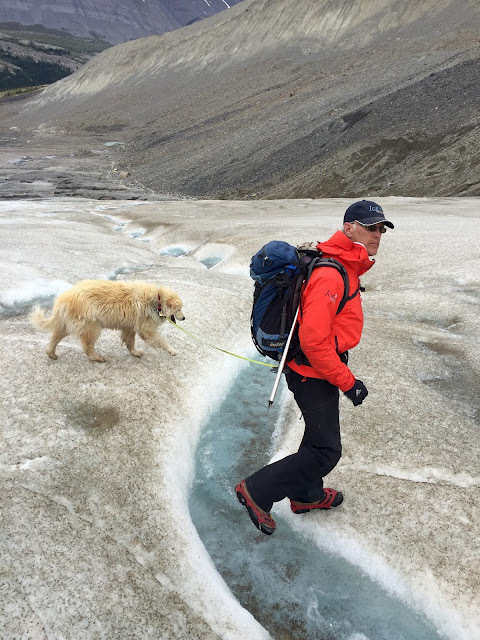 We continued a steady path up the mainly flat, but bumpy glacier stopping periodically for Peter to show us something or give us a little more information. It was never a hard hike by any means, but I was surprised just how far away the ice fall was once we actually started to head in its direction. As we headed up, Peter would periodically instruct us to wait, then head over to check out an area. 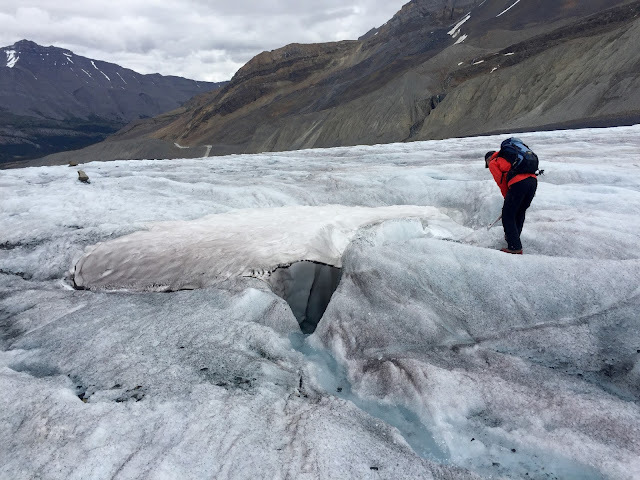 Despite being on the glacier all summer long, it's constantly changing so before he made any assumptions or showed us anything he would first inspect it himself. I never felt in any danger out on the glacier with Peter, but he did make a point to show us all the snow patches and instructed us to be sure and avoid them no matter what. I knew it was very important when he even went so far as to instruct a group from the Netherlands to be sure and tell their kids in their native Dutch to ensure they fully understood. As we quickly saw first hand, you never know exactly what is underneath the snow. It wasn't long before we saw an opening to nowhere at the edge of one. 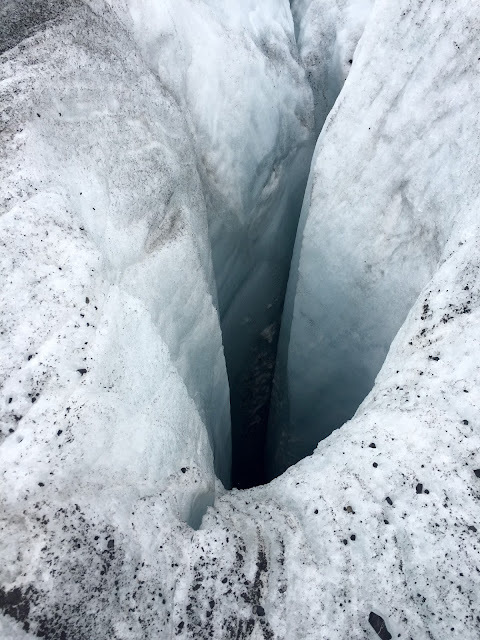 Peter also pointed out a few crevasses along the way. He'd scope them out, cut a place in the ice for us to stand then hold our arms as we slightly leaned over for a peak. It was pretty amazing and intimidating at the same time. 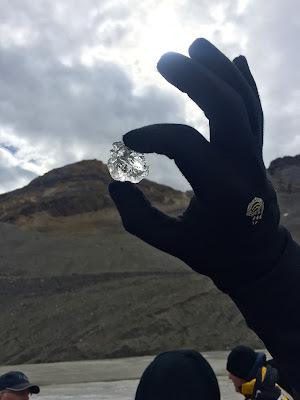 We also stopped along the way and had some fresh glacier ice. He picked a few inches below the dirty surface then passed around a bit for everyone to try. It was cold, imagine that! About 2 hours in, the weather started to look iffy and we headed over to the edge to see it if would pass, take a break, and have some lunch. Luckily for us, it did. Right as we were finishing our lunch the skies opened up and the sun started shining on us. 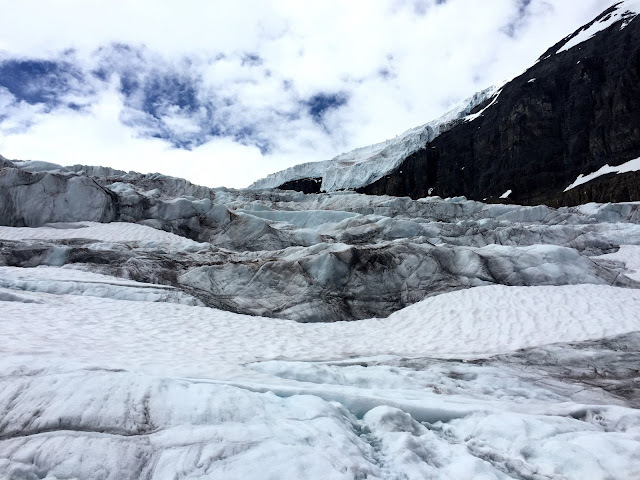 I was so excited because it was the first time the sky over the glacier was nice (we had seen it two other days prior always with cloud cover) and so we made our final push to the icefall. We finally made it after 2.5 hours of walking. From this point on Peter explained it was no longer safe enough to take a group. And standing there at its base it wasn't hard to figure out why. Some of the sections of icefall were larger than cars and Peter made sure we stayed in a tight area as we hung out admiring it. He also broke out a Mars bar and explained all the different changes and events that occur on a glacier. Everyone was all ears including George which was a first for him. It was amazing to stand at the icefall and look back towards the toe of the glacier. What seemed like such a small distance that morning was suddenly a massive expanse. One amazing thing we learned from Peter was that there is an expansive cave system in the area and one finger actually terminates at this glacier. 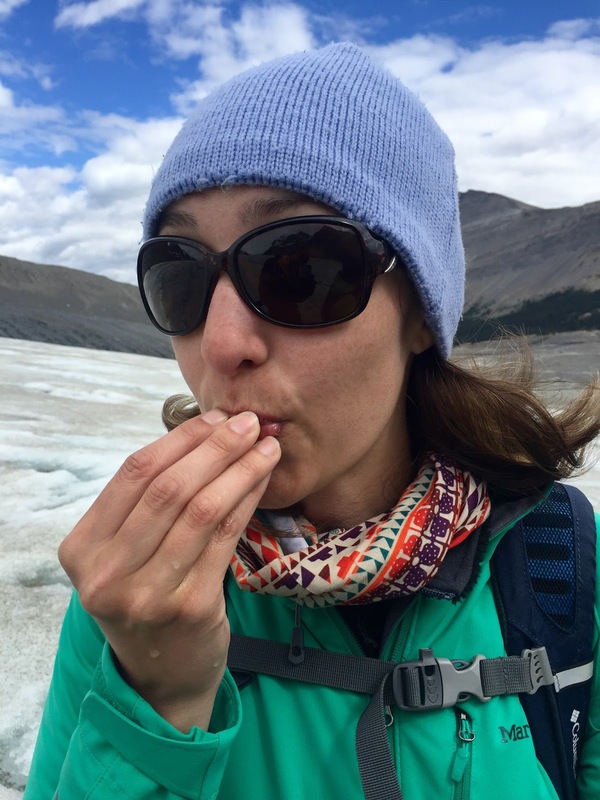 There they found a red squirrel frozen in the glacier and by dating the squirrel they presume he was frozen in his place when the glacier was first forming, 5,000 years ago. It was incredible to stand there and ponder that a bit. 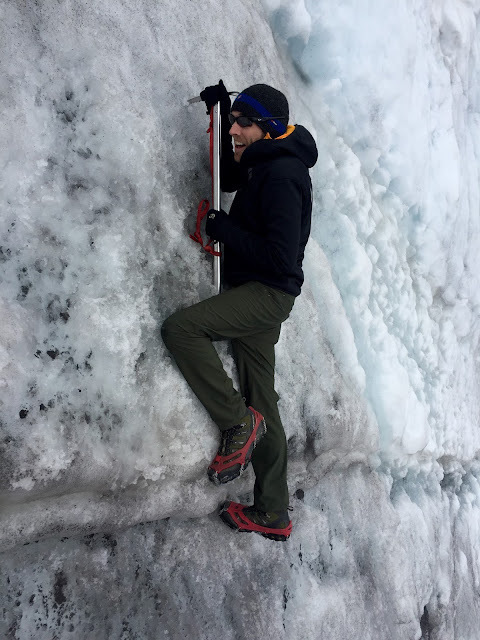 Adam even borrowed Peter's ice axe to try his hand at a little climbing (or at least take a picture making it seem that way...). Either way, he's a natural. We didn't get have too much fun though because before long it was time to pack up and head back down. It was a long trip up and it was going to be just as long going down. Once again Peter and George took the lead. We headed in the same direction as the flowing streams and marveled at the speed in which the water was flowing. These rivers of water often terminated into a water slide of the unknown called a moulin or millwell. When looking at these moulins and crevasses all I could think about was the movie Touching the Void. I didn't want to end up like Joe Simpson falling into one of these. On the hand, they were mesmerizing to watch. I just made sure to keep a safe distance. 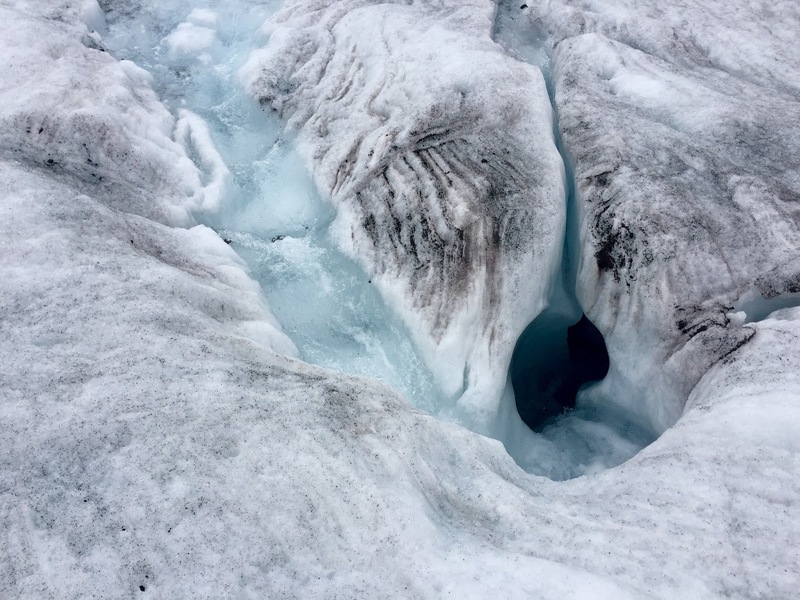 Of course the best part of our glacier hike was returning safe to our cars having been able to enjoy a wonderful day on a rare glacier. It was informative, fun, and such a unique experience for us. We hope to be able to do the shorter tour when we bring Landon back so he too can experience a glacier first hand as well. Anyone who gets a chance to enter this beautiful region of the world should make this a must do experience. Although, I realize there are no amount of pictures or words that can properly explain the sheer size of this moving fortress of ice, Adam did capture one shot as we left the icefall that kind of puts it into perspective. I urge you to click on the picture (to make it full screen) and think of this. 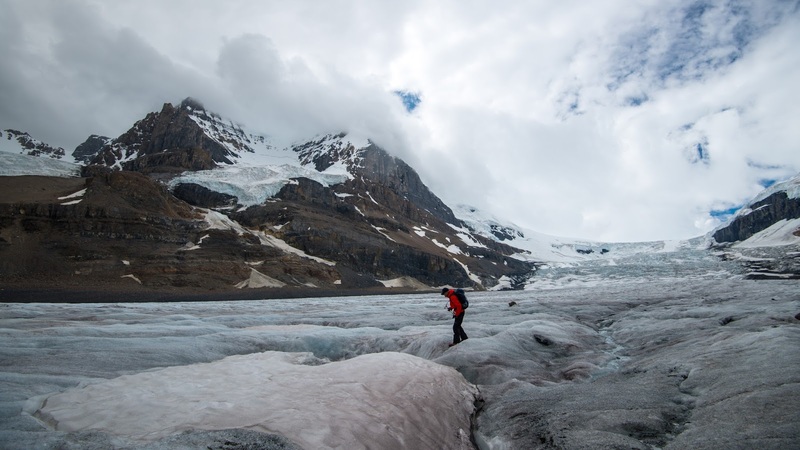 This picture was taken near the first of three icefalls on Athabasca Glacier. Two more sit behind this one. It took us over two hours of walking to reach this point from the toe or terminus of the glacier. However, even more astoundingly is the fact that this glacier, the entirety of the Athabasca Glacier, is a single toe of which there are six principal toes of the Columbia Icefield. Those colorful ants on the bottom middle-right are a group of people. 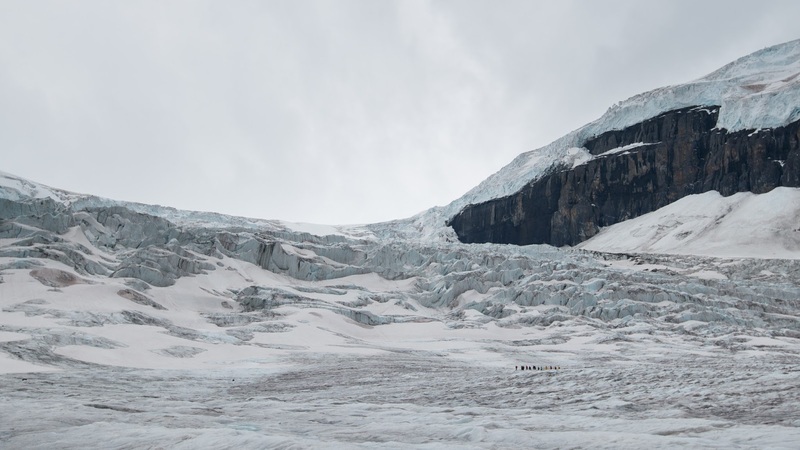 Do you think they'd even appear as a speck of dust if you were looking at the entire icefield? I think not. The world is an amazing place.